Click the button below to add the Superior Threads Frosted Donut - 35 Prewound MasterPiece L Style Bobbins to your wish list. Frosted Donut I (original 35 colors in a blue BobbinSaver). 35 colors from our Frostings, L style prewound bobbins with our MasterPiece Thread. Tucked into a BobbinSaver for safe keeping and instant access to all colors! MasterPiece is #50 100% extra-long staple Egyptian-grown cotton. 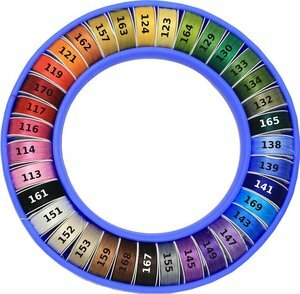 Colors in the Frosted Donut (in order): 113, 114, 116, 117, 170, 119, 121, 162, 157, 163, 124, 123, 164, 129, 130, 133, 134, 132, 165, 138, 139, 141, 169,143, 147, 149, 145, 155, 167, 168, 159, 153, 152, 151, 161. I love these bobbins, a lovely strong quality cotton thread which being thinner means there is a lot more thread on the bobbin so they last longer. Great selection of colours. Bonus application is that if you need a selection of thread colours for hand appliqué you can just grab the donut and these threads are great for hand stitching too - the thread just disappears making your stitches close to invisible. Great array of colours in an easy to carry ring. Do not need to carry a large collection of large spools when out and about. Great price as well. I love these threads for needleturn applique' as there are such a fabulous variety of colours. The threads are so beautifully fine that they 'sink' into the fabric and can hardly be seen at all. Perfect for paper-piecing on the go! I bought this to use for my English Paper-pieced hexy project. It is perfect! The range of colours is great, the cotton is silky soft but still nice and thick and the bobbin holder keeps them from unraveling in my bag. Thanks Jane!